"Ram Bagai Picture Presentation At New York's Little Carnegie Theatre Favorably Reviewed By New York Critics"
Article published by Ram Bagai’s employer (Plum Brook Ordinance Works of Sandusky, Ohio) in their house newsletter, P.B.O.W. News, to congratulate Bagai on his successful movie opening in New York. "Through India With Camera and Mascara"
Newspaper article providing back story about how Ram Bagai acquired “Gyandev of India” among other Indian films during a trip to India in early 1940. Pre-opening publicity for "Gyandev of India"
Film synopsis of "Gyandev of India"
"Correspondence between Ram Bagai and M.R. Ahuja, the Indian Consul General in San Francisco, that took place eight years after Bagai opened “Gyandev of India” in New York City. After 1943, Bagai showed Gyandev at various cinema art houses, Indian-American cultural events, and universities, including the University of Hawaii in 1951. Brochure for "Gyandev of India"
This brochure was handed out at film showings from 1943 until 1951 when Bagai removed the film from circulation. 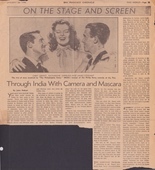 Movie reviews of "Gyandev of India" that appeared in various New York newspapers. Playbill from the Little Carnegie Playhouse for Gyandev of India. Photograph of Kala Bagai, taken in 1915 at age 22. Photograph of Vaishno Das and his family before immigration to America. Vaishno Das Bagai is reclining in front, in white. His oldest son Brij is next to him in the dark jacket, and his second son Madan is behind him on his grandfather's lap. Back inscription reads: "rear: Dolan[?] Das, baby, Amer Das, Ram Das (Papa's uncle), Gopal Das, [unknown], baby Chamanlal.